Easily accessible from Davis via Interstate-80 and Amtrak rail service, Sacramento gives UC Davis School of Law students the opportunity to enjoy the benefits of a large metropolitan area with thriving business, financial, and legal communities and a wide range of social and recreational opportunities just 15 minutes away. 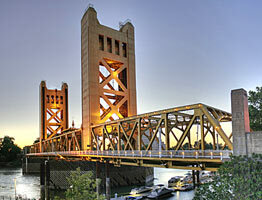 A city of approximately 475,000 residents, Sacramento is extraordinarily diverse, with a population that is about 22 percent Latino, 17 percent Asian, and 15 percent African American. The city abounds with quality restaurants reflecting a broad variety of ethnic traditions, places of worship serving all of the world's major religions, and annual events including a "Juneteenth" celebration of African American history, the Sacramento Pride Festival celebrating the LGTB community, a Día de los Muertos procession and art exhibition, the California State Fair, and many other events reflecting the region's melting pot culture. 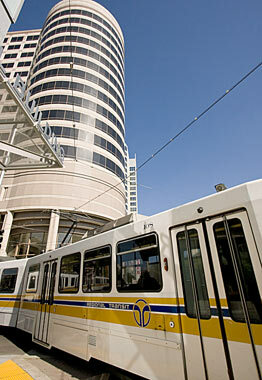 The downtown area surrounding the capitol, easily accessible by Sacramento Regional Transit District light rail and bus service, bustles each weekday as state legislators and government workers conduct the business of the world's tenth largest economy. By night, much of the city's activity is focused in "Midtown," the area just east of the State Capitol. Although restaurants, dance clubs, coffee shops, and other social amenities can be found throughout the many unique neighborhoods in the city's nearly 100 square mile area, Midtown is teeming with opportunities to enjoy live music and dancing, gourmet dining, live theatre, museums, movies, and more, with a rich calendar of events year-round. As one of California's largest cities, Sacramento enjoys all the amenities of a major urban area, including an international airport, professional basketball and baseball teams, theatre companies, museums, a symphony orchestra and ballet company, and more. 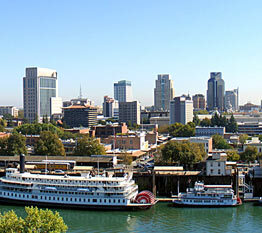 Sacramento's warm sunny climate and active population have contributed to a reputation for outstanding outdoor recreational opportunities. The region is uniquely bicycle friendly, and is home to the American River Bike Path, a 32-mile paved trail along the banks of the American River that ranks among the nation's premiere cycling resources. Recreational facilities include an extensive network of city parks, ranging from the large William Land Park to small neighborhood commons. Recreational opportunities ranging from kayaking and river rafting on the American River to snow skiing in the Lake Tahoe area, or a day trip to San Francisco or the Napa Valley wine country are just a short drive away.